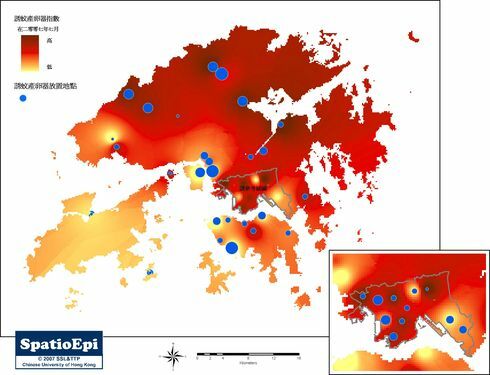 The map shows the distribution of reported local dengue cases from January 2001 to August 2017 in Hong Kong. 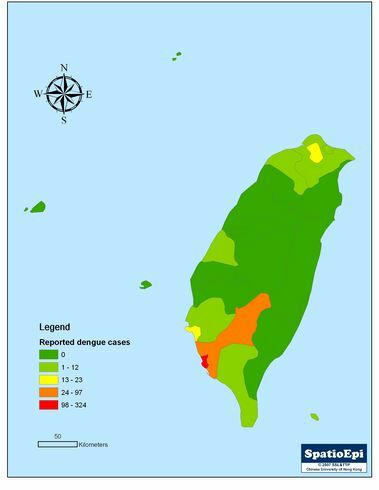 In the past 16 years, only 35 dengue cases were locally acquired, accounting for 3% of total reported cases (n=1027). 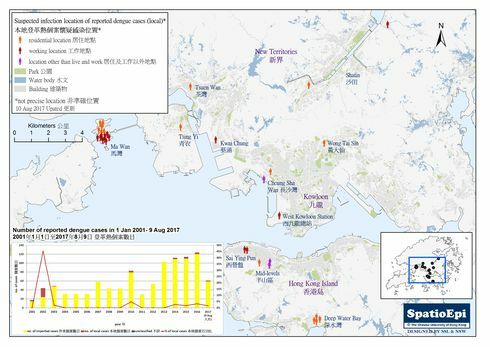 Limited local outbreaks (2 or more cases) have occurred: 15 cases lived near or worked in the Ma Wan construction site in 2002, 4 cases lived in Deep Water Bay in 2010, 2 cases worked in the Sai Ying Pun construction site in 2014, and 3 cases visited the Hong Kong Zoological and Botanical Gardens or lived in the Mid-levels in 2016. Over the years, the local outbreaks had not occurred in the same area. Overall, most of the suspected infection locations were in urban areas (grey building blocks on the map). 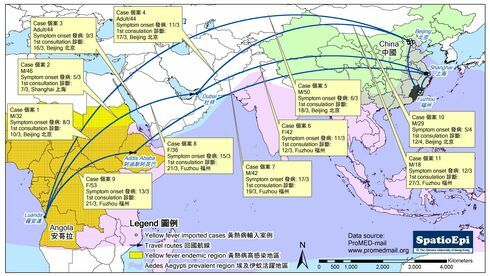 The pattern of reported cases was different from those of Japanese encephalitis, which were found near pig farms (map: headaches near pig farms). 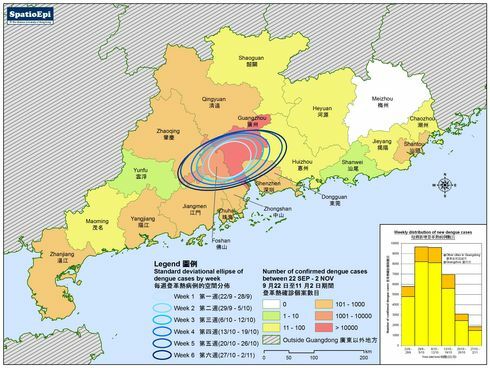 Data for the map were extracted from media reports. Dengue is an acute infection caused by the dengue virus Flavivirus. Clinically it can manifest as dengue fever or dengue haemorrhagic fever (DF/DHF). Oviposition trap (Ovitrap) index is a marker for assessing mosquito growth using a simple device placed in the outdoor environment. 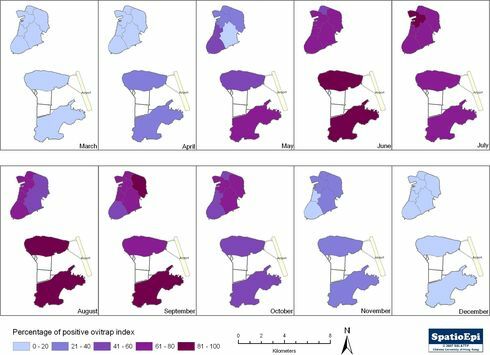 This in turn supports the evaluation of dengue risk in the human population. Dengue is spread through the bite of several species of the Aedes mosquito which carries the dengue virus. 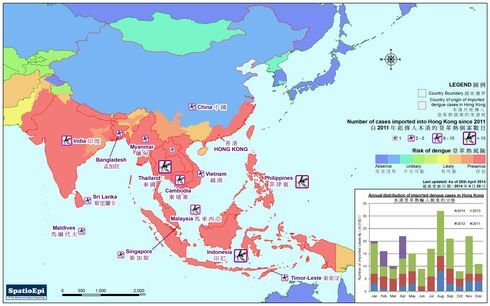 In Hong Kong and Macao, the responsible vector is Aedes Albopictus. Aedes aegypti is the most important vector worldwide. 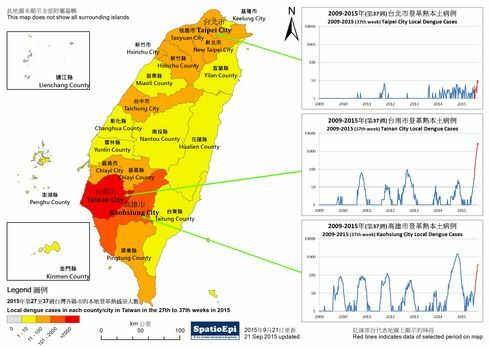 Both types of mosquitoes are found in Taiwan. Currently there is no promising vaccine to protect from dengue virus. The best measure is to minimise the breeding grounds of the Aedes mosquitoes by for example sealing up puddles of stagnant water, and avoiding mosquito bites.